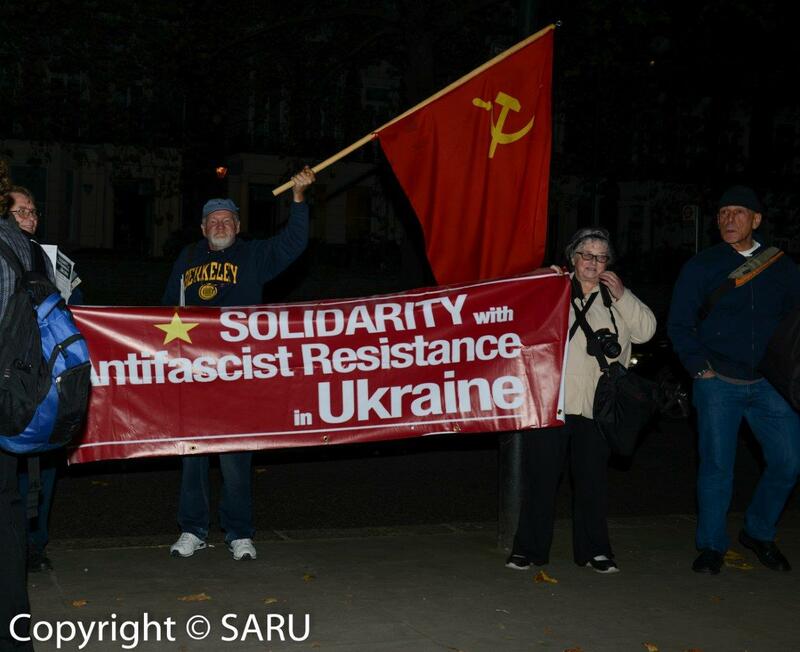 Anti-fascist campaigners protested the visit of far right Ukrainian politician Andriy Parubiy to London on Friday, October 23. Parubiy meet with a number of MPs (Conservative, Labour and SNP) and spoke at a public meeting during a visit paid by the British tax-payer. In the morning, campaigners gathered outside the Royal United Services Institute, an “independent think tank” linked to the British establishment, where Parubiy had been invited to speak. RUSI had published a short biography of Parubiy which omitted all of his far right links, including the fact that he was a founder of the neo-Nazi Social Nationalist Party of Ukraine (see: “Who is Andriy Parubiy“). Members of staff who came out to talk to campaigners expressed their discomfort with the fact that he had been invited. RUSI director Michael Clarke also spoke to campaigners to defend his decision to invite him. 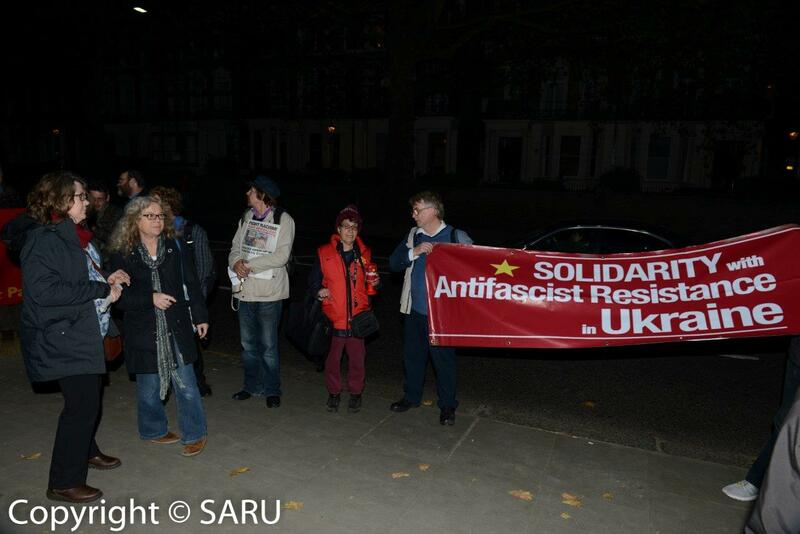 In the evening, anti fascist campaigners gathered outside the Ukranian Cultural Centre, where Parubiy was also invited to speak. Some of the campaigners were carrying red Communist flags which drew a very angry reaction from some of those going into the meeting, this being a symbol which has now been banned by the Kyiv authorities. During his stay in the UK Parubiy met with Labour Lord Robertson, former NATO general secretary. He also met with Shadow Leader of the House of Commons Chris Bryant, with Labour MP Stephen Pound and SNP MP Stephen Gethins MP. In a separate report, Tory MP Daniel Kawczynski also met with Parubiy (https://twitter.com/KawczynskiMP/status/657155955323445248). Andriy Parubiy, in his Facebook post makes it clear that his trip has been “paid by the host party, not costing the Ukrainian tax payer a penny”. This entry was posted in Events and tagged Andriy Parubiy, London, parubiy, snpu, Ukraine. Bookmark the permalink.